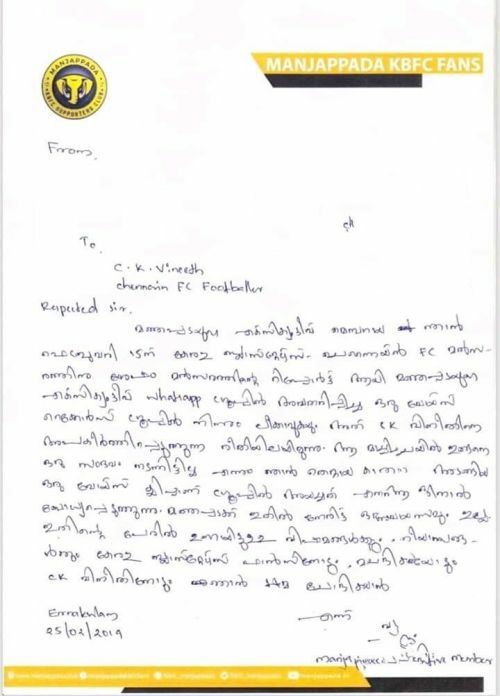 Former Kerala Blasters star CK Vineeth has taken back his complaint against members of the Manjappada, the team's fan group, after receiving an apology letter from the group's top member. 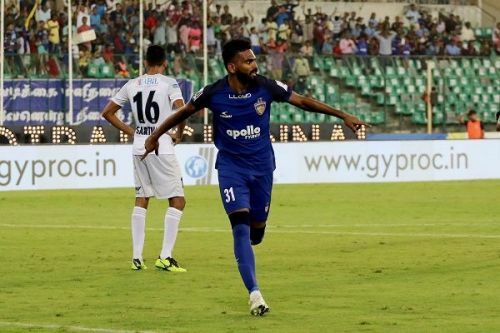 Vineeth, who moved from Kerala to Chennaiyin FC in the winter transfer window had approached the police alleging 'cyber attack' from a member of the Manjappada. A Whatsapp voice note from a top member of the Manjappada claimed Vineeth bullied a ball boy during Kerala Blasters' match against Chennaiyin FC on Feb 15. Vineeth denies that he screamed at the ball boy and says he only raised his voice because the ball boy could not hear him. The 30-year-old then started a campaign against cyberbullying last week. Two people, Bichu and Prabhu, were summoned by the police after Vineeth's complaint. It appears Vineeth has let the matter go now after receiving an apology from a Manjappada executive committee member. "I, an executive member of the Manjappada, had given a voice clip as a match report after the Kerala Blasters - Chennaiyin FC match on February 15 to the Manjappada executive Whatsapp group, which was leaked," the letter, written in Malayalam, says. "It was defamatory to CK Vineeth. The incident mentioned in the voice note hadn't happened on the day and I admit I sent a voice clip with a fake incident. "I regret my actions and apologise for the same." Vineeth turned out for Kerala Blasters from the 2015 season but moved to Chennaiyin after his relationship with the fans turned sour. Vineeth claims he receives abuse on his social media accounts whenever the team performs badly. Vineeth thinks the fans' way of criticising his performances is not right and spoke about leaving the club back in November. His return to Kochi did not go as planned as Chennaiyin lost 3-0 to Kerala Blasters with Vineeth being constantly jeered. Vineeth accused the Manjappada of hate mongering, telling a news channel that they were out to destroy his career. The fan group initially claimed that one person's view does not reflect the entire's group opinion about Vineeth. They were then forced to accept that the voice note emanated from their executive committee member and released a statement apologising to Vineeth. "The person who is speaking in the clip is an executive member of the Manjappada Ernakulam wing and he just narrated the incident from his perspective without any solid evidence... Manjappada condemns the fact that the clip originated from one of our Whatsapp groups and we pledge to make sure that no such incident happens in future. We have conveyed the same to CK Vineeth's representatives in the presence of Ernakulam ACP (Assistant Commissioner of Police)," the Manjappada said in a statement earlier.